With over 20 years experience London Lifting Gear are specialists in lifting, height safety and materials handling equipment. We operate both nationally and internationally serving all industries from multi-national corporations to individual enterprises. Our products and services extend to supply of all types of equipment from standard hand operated chain hoists to custom designed lifting solutions for the railway, power generation, mining, petro-chemical, steel and construction industries. We operate nationwide from 2 strategically placed depots via our group companies London Lifting Gear in Barking & APP Lifting Services in Doncaster providing full UK coverage. We are members of LEEA (Lifting Equipment Engineers Association), ensuring our work practices conform to the latest legislation, standards and good practice. We also operate quality systems compliant with BS EN ISO 9002 to maintain the quality and traceability across our product and service range. London Lifting Gear manufacture, sell, hire, service, repair and inspect all forms of lifting, pulling and height safety equipment. Sales of lifting equipment and accessories. 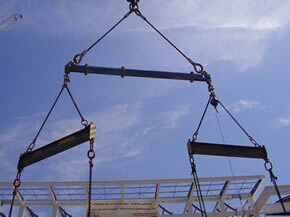 Design and manufacture of special application lifting solutions. Sales of material handling equipment. Runway design, build and install. Light engineering and machining including milling, turning and fabrication. Lifting equipment hire service and repair. Fast, reliable repair and service. Inspections and proof load testing. Manufacture of leisure and commercial net products are available through Hammond and Taylor. Our website can only provide a small overview of the vast range of equipment we offer. As a forward thinking company our ever-increasing product range and hire fleet are subject to minor technical detail and product changes. Please contact our dedicated sales staff at your closest depot for critical technical information ensuring you get the right equipment for the job.